Boat safety tips are something that everyone should take seriously. It's important to know boat safety rules, even more so to practice them. When in the Florida Keys boating you're often miles from shore. You're also out on the water in an area that can produce rough weather very fast. It's important that you understand water safety, and follow simple safety tips to keep you and everyone else protected. Often you'll be in unknown territory, and if you don't know the "lay of the land", you're at even greater risk if something goes wrong. The following water safety tips will give you useful guidelines so you'll be better prepared for whatever water sport activity you'll be pursuing. A word of caution though. If you were born 1988 or later you MUST have a boat license. Proper boating certification is required and if you don't have it you will be fined. In actuality, you won't even be able to rent a boat on your vacation in the Florida Keys without it. 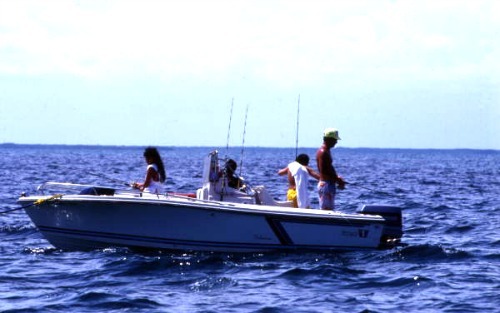 Florida Fish and Wildlife has additional information on this subject with links directing you to options so you can get your boating certificate. Whether you are here on vacation and need a temporary certificate or you're a resident, the above link will direct you to the right place so you can get the certification you need to enjoy Florida Keys water activities! You may also want to check out Florida Fish and Wildlife's link to their FAQ section. Especially if you're from a different country and are on your Florida Keys vacation, you'll be able to get reliable information so you're compliant with the boating safety laws. Florida keys weather is "fluid" at best. It's advisable to always check the weather before you go out in your boat. You'll also find that it's extremely beneficial to also check tide information. 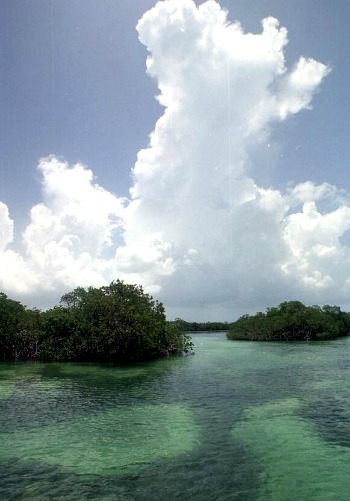 In the Florida Keys where the water depth can be marginal at best, tide monitoring can be critical. When the tide is out, the water will be even shallower, making it easier to ground. During these times it's best to be aware of your surroundings and travel at a slower speed. This marine weather forecast link will give you up to date information on the different regions throughout the Florida Keys. It includes weather alerts and forecasts, information on the tides, cloud cover, lightning protection, water temperatures and other interesting data that are relevant to water safety. Another very important safety tip relates to completing your float plan. Writing down your float plan is similar to filing a flight plan. You want to let people know when you're going, who you're traveling with, where you're headed, and how long you expect to be gone. This is a life saving step you need to take. If something happens to you or your boat, and you're unable to radio for help, a search party will have a reasonable idea of where to start looking for you. Make sure that you leave your float plan with someone reliable who knows when to expect you back. If you're not back within a reasonable time frame, make sure the person who has your float plan knows to alert the authorities. The phone number for the United States Coast Guard in Key Largo is 787-729-4392. The USCG can be reached in Islamorada at 305-664-8077. The Marathon USCG can be reached at 305-743-1934, and the number for the United States Coast Guard in Key West is 305-292-8077. You can click here to download a USCG boating safety printable float plan. Boat safety tips revolve around the fact that being on the water can be dangerous. Any body of water, even small lakes can be hazardous. However, the risk factor increases when you're on large bodies of water. The Atlantic and the Gulf of Mexico can be unforgiving if you get into trouble, and you don't want to ruin your Florida Keys vacation because you were careless. This is why one of the most important USCG boating safety tips revolves around life jackets. The Coast Guard recommends that life jackets be worn at all times when in a boat. Accidents happen on the spur of a moment. When they do, you'll have no time to reach for your life jacket. In fact, the USCG estimates that 80% of boating fatalities would have been prevented if a life jacket had simply been worn. Your boat rental should come with life jackets. Make sure you have enough for everyone onboard. However, if you're taking your pet with you, there won't be one for Fido and you should consider bringing an appropriate pet life jacket with you. Recently a man boating in the Atlantic lost his dog at sea. The poor older dog fell overboard and the man didn't notice. Fortunately, not much later, a couple boating by happened to spot the dog. This is no small thing when you consider the size of the ocean and the size of the dog. In this case, the ending was happy, but all to often it's not. Don't let disaster affect you, your family and friends, including your best friend Fido. Make sure everyone has a vest - they save lives! One of the most obvious boat safety tips is also based on common knowledge. Everyone knows they shouldn't drink and drive, but when it comes to boating this is even truer. Not only could you face huge fines, possible jail time and boat licensing revocation, the effects of alcohol are accelerated when on the water. A person's judgment, balance, inability to read the water correctly, and other impairments can quickly spell injury or death. One of the more important boat safety tips centers on the warning signs and symbols positioned throughout the water. These signs are there to alert and guide you, but if you don't know what they mean, you'll end up in trouble. You can click here to download the United States Coast Guard's helpful, lifesaving and easy to understand brochure. It's entitled U.S. Aids to Navigation Systems. Boat safety tips also include obvious clues that people don't always connect with. For example, if you come across a mooring buoy, it's there for a good reason. The buoy was placed so boaters would have a place to tie off on, instead of throwing out their anchor. Why? Because there's a coral reef near the mooring buoy. By not using your anchor you're avoiding any potential damage to the reef. Even if you have no intention of using the buoy, by connecting the dots you should realize that proceeding further would mean hitting a jagged reef. Other boat safety tips that are obvious relate to the fact that if you see a mooring buoy near a coral reef, people Florida Keys diving and snorkeling are likely in the area. Look around, and if you see a few boats tied to the buoy, and no one's on board, or only one person is in the boat, divers or snorkelers are in the water. 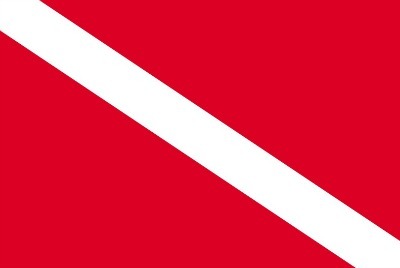 Watch for the diver down flag to alert you because as much as you don't want to hit a coral reef, you want to hit a diver even less. If you've never seen a diver's down flag, these two pictures will show you what to watch for. Other boat safety tips include paying attention to obvious warning signs. 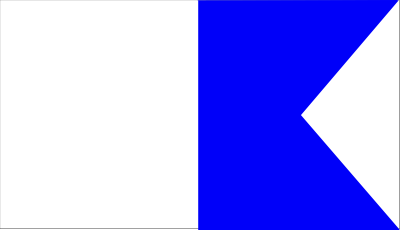 These safety symbols include light towers near reefs which caution ships of impending danger. There are also 10 foot tall warning symbols used to mark shoals, alerting boaters to the hazards beneath. Useful boat safety tips also include remembering to watch the sky. Weather can quickly change, waterspouts can form, and Florida thunderstorms can roll in fast. If you picture yourself as a sitting duck out in the middle of the perfect electrical conductor, you'll be more inclined to monitor Florida Keys weather. Another worry about Florida storms developing is that the calm water can turn rough very quickly. Winds can make it difficult to manage the boat, plus they'll often churn up the silt below, making the water murky. This and the dark skies will decrease your ability to see beneath the water's surface. To avoid hitting an obstruction and becoming stranded in the middle of a dangerous storm, you'll need to increase your level of observation. Conversely, glass smooth water can be hard to read. The reflecting nature makes it difficult to see below, and the glare will add to your navigation problems. To ensure that you have the best vision possible, always wear a pair of polarized sun glasses. One of the features that makes the Florida Keys so spectacular is the incredibly beautiful and warm tropical water. However the expanse of ocean surrounding this chain of islands also presents boaters with a unique set of challenges. The water is very shallow, almost non-existent in places. It's also filled with lots of small and large coral reefs which are sharp, dangerous and protected by law. If you're aware of important navigational boat safety tips including how to recognize what's in the water around you, your time on the water will be more fun, and less stressful. For example, the water offshore can be quite shallow even for miles. 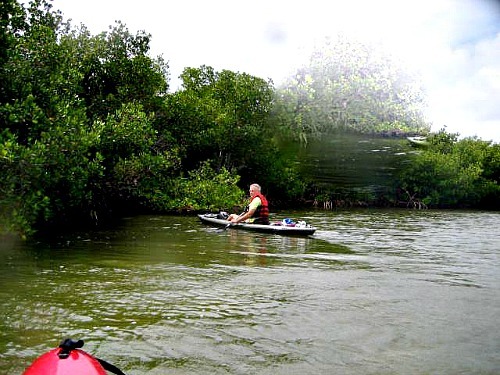 In these waters you'll encounter numerous grassy seabeds, sand shoals and patch reefs. These are a primary habitat for smaller marine life and often serve as juvenile fish nurseries. If you understand that these underwater obstructions extend for miles around you, you'll slow down and watch your surroundings more carefully. Better visibility is important, and this is why V hulled center console boats are so popular. Another of the more useful boat safety tips is that the objects you're seeing beneath you, are closer than you think. You typically don't have as much cushion between you and the obstruction, so you need to act quickly before grounding on it. 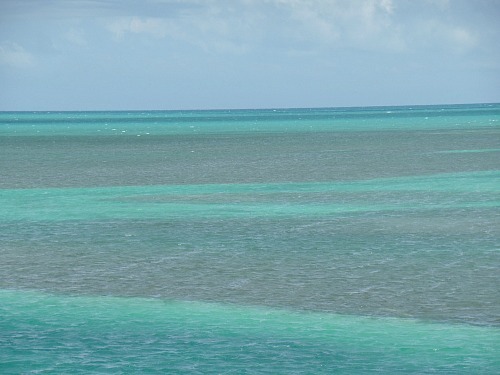 The waters off the Florida Keys are known for their amazing multihued colors. This is not by accident. The water has these incredible shades due to the different depths and because of what's beneath it's surface. One of the better boat safety tips is to learn and understand the color of the water, so you'll know when and how to avoid a problem. The Florida Keys National Marine Sanctuary has a simple to remember, catchy little phrase that will help you avoid disaster. "Brown, brown, run aground. White, white, you just might. Blue, blue, sail on through. Green, green, nice and clean." Remembering this little ditty, if you encounter brown patches in the water, this usually indicates that you're coming into an area filled with reefs and/or seagrass beds. Likewise, if you can't tell the color of the water, but you can see that it looks different then the adjacent water, or you notice that it's starting to ripple, you're likely coming into a reef or seagrass bed. At this point you need to slow down, exercise caution, and increase your level of attention, especially if you notice that waves are beginning to break. If waves are breaking, you're getting close to a fairly substantial substructure and you'll want to steer clear of this area. If you don't react soon enough, or pay attention to these simple clues the above ditty provides, you'll likely ground and damage your boat. You'll also destroy many of the microorganisms and small marine life inhabiting the area such as sea horses, crabs, and coral. One of the other important boat safety tips you should know about involves sand bars. If you're moving through the water and notice that you're coming into an area that appears white, you're entering a water zone that has sandbars. A helpful marine safety tip to remember is that if it's overcast or there's too much glare, chances are you won't be able to see below. If that happens keep an eye on the water's surface. If you notice that the water has suddenly changed and become glassy, this will alert you to the possibility of a sandbar in the area. Sandbars sound soft and nonthreatening but if you ground on one, you're basically stuck. Some of the 1733 Spanish Treasure Fleet that were forced over the coral reefs could have been refloated if they hadn't grounded on the shoals. Unfortunately the Spaniards were unable to work them free, and were forced to burn these ships to the waterline. Boat safety tips also include the color green which means you're in shallow water and free of dangerous obstructions. When you enter green water, shallow draft boats can easily proceed with caution. However, if you're operating a larger, deep draft boat, you'll need to monitor your depth finder and check your marine charts for clearance. The final color everyone anticipates is blue. When you see this color you're in deeper water, which means sand bars, and grassy areas won't be a problem. 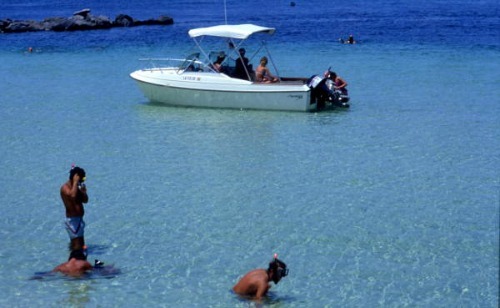 Boat safety tips in the Florida Keys always revolve around the coral reefs. Just because you're in blue water doesn't mean you're home free. The water off the Keys are littered with the remains of large ships that ran aground a reef and sank. Knowing this, remember to watch the water's surface for any unusual signs of waves breaking. There's likely a substructure lurking at or just below the water surface that could tear your boat apart. It's not uncommon for coral reefs to rise up, or out of the water's surface. If you see waves breaking, steer clear of this area, and remember to monitor your depth finder. Boating accidents unfortunately happen to even the most cautious operator. If you should collide with a reef, the sharp jagged coral can seriously damage your boat's hull. The first thing to do is cut your engine. This protects your motor and the reef. If it's possible to lift your motor do so, then wait for high tide so the current can drift you off. If you are unable to drift off the reef, or if the current is forcing you further onto the reef, radio the Coast Guard for help on VHF Channel 16. 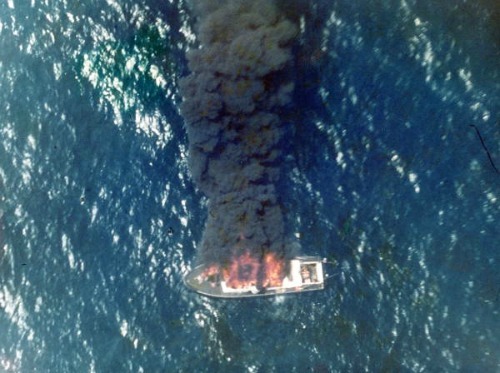 Grounding on a coral reef is devastating to you, your boat, and to the coral. The Florida Keys coral reefs are severely endangered and massive coral reef restoration efforts are underway. Your act of grounding on a coral reef is a major problem for the entire marine ecosystem, and can even have impact on the economy of the Florida Keys. The important thing to remember about boat safety tips is that they've been developed for your boating safety. Familiarize yourself with the appropriate boating regulations and rules, and inspect your boat equipment to make sure it's operational. Carry boat safety gear and first aid equipment with you, and write out a float plan. The waters off these islands are a boater's delight, but they're also subject to Florida Keys weather which can quickly turn volatile. By following common sense boat safety tips, you'll ensure you have a safe time on the water and that your Florida Keys vacation doesn't turn into a nightmare.